A tricycle driver and his pregnant passenger survived Saturday an old Palawan Cherry tree whose trunk snapped out of its roots and its branches fell on them along the national road in Barangay Tiniguiban. Kilos Agad Action Center (KAAC) personnel Raffy Lagrada identified the survivors as Angela Zumarraga, 26, and Jerry Salas, 38, who are both residents of the same barangay. 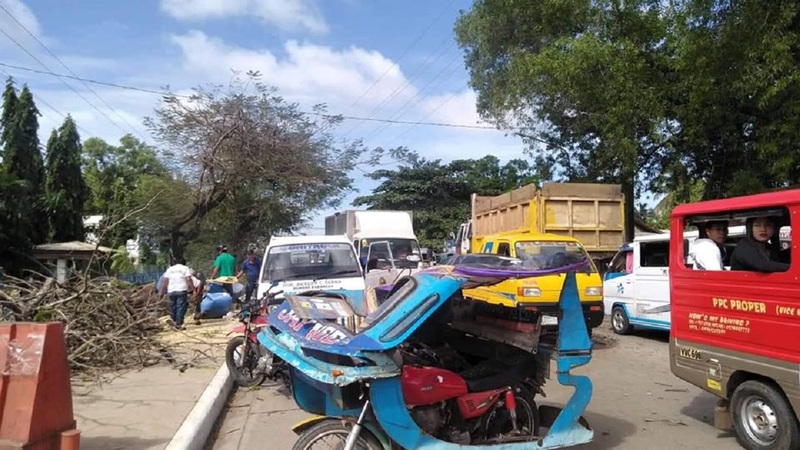 He said Salas was driving his tricycle through the highway when the tree fell and its branches hit the passenger side where Zumarraga was sitting. “Disgrasya talaga [na] nagkataon lang na padaan ‘yong tricycle nang saktong nabuwal ‘yong puno. Iyong puno po [ang nabuwal] pero ‘yong tumama lang sa kanila ay branches lang (The tree fell when they were passing by. The tree fell but it was its branches that actually hit them),” Lagrada said. He said they immediately conducted first aid and brought the two to the Palawan Adventist Hospital (PAH) to be checked for injuries. Lagrada, however, said that Salas did not want to be confined. “Yong driver nagpadala sa Adventist Hospital pero hindi na siya nagpa-confine. Bale, umuwi na din siya ng bahay nila. Nag-complain lang siya na masakit ang ulo niya. Wala namang iba, walang aberrations. Si Angela naman, nagpa-admit siya sa Adventist Hospital, kasi nag-confirm siya na pregnant siya. May konting sugat sa parte ng katawan niya, meron din sa mukha, pero minimal lang naman,” Lagrada added. Lagrada noted the incident was reported to them by personnel of the Puerto Princesa Land Transportation Terminal (PPLTT) at around 1:21 p.m. on Saturday, January 5. Lagrada said the KAAC team immediately responded just after a minute and arrived in the area at exactly 1:22 p.m. He further said it took them “six minutes” to remove the victims from the tricycle with the tree-branches still on its roof. “Siguro mga maximum of eight minutes nandoon na sa ospital ‘yong dalawang pasyente. After namin matanggal ‘yong victims doon, kami na rin ang nag-operate ng pagputol ng puno para matanggal [na] doon [at] madaanan na [ng mga motorista] (In about eight minutes, they were already in the hospital. After we removed the victims, we also operated to remove the tree so the highway can be accessed),” he said. No one else was injured when the tree fell, according to Lagrada. He said the tree appeared okay on the outside, but its trunk has decomposed.